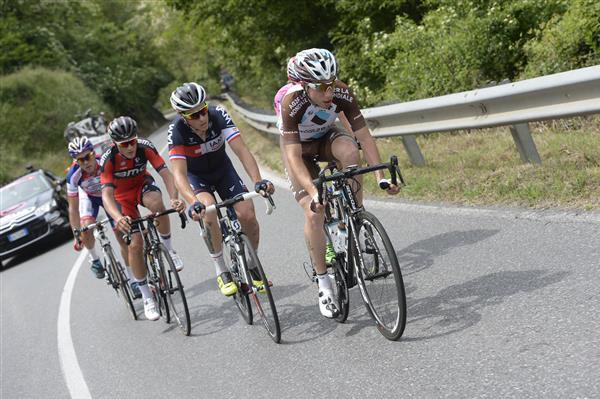 The Race: A break of five riders that included Sylvain Chavanel, Jan Polanc and Axel Dumont went clear. At one point the escapees had a 12-minute gap on the peloton. 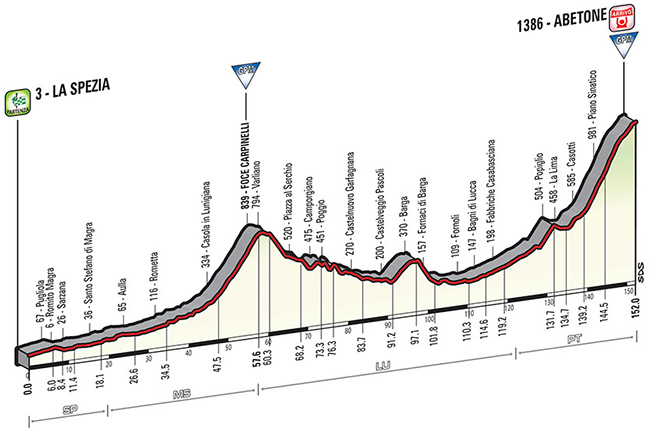 When they reached the final ascent to Abetone (17 kilometers with a 5.4% average gradient), they still had 10 minutes. Chavanel was the first to attack, but that merely served as a springboard for Jan Polanc to get away. Polanc was never seen again, finishing a minute and a half in front of his first chasers. Back in the pack, six kilometers from the finish Alberto Contador took off, taking Richie Porte and Fabio Aru with him. They just caught Chavanel at the end, who finished a few meters ahead of the Contador trio. 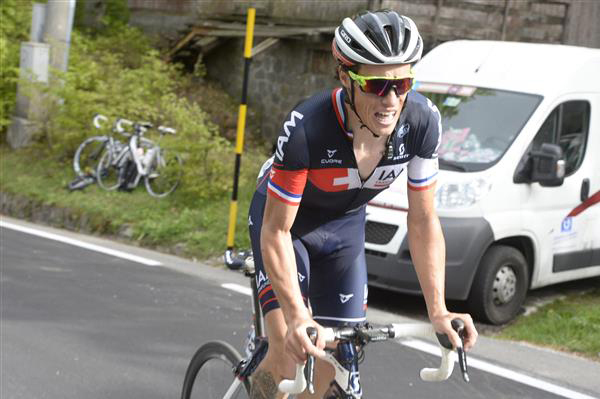 Chavanel, at 35, is riding his first Giro d'Italia. Polanc won the stage, but Contador gets the important booty he was looking for, the maglia rosa. 4 Alberto Contador Tinkoff-Saxo s.t. 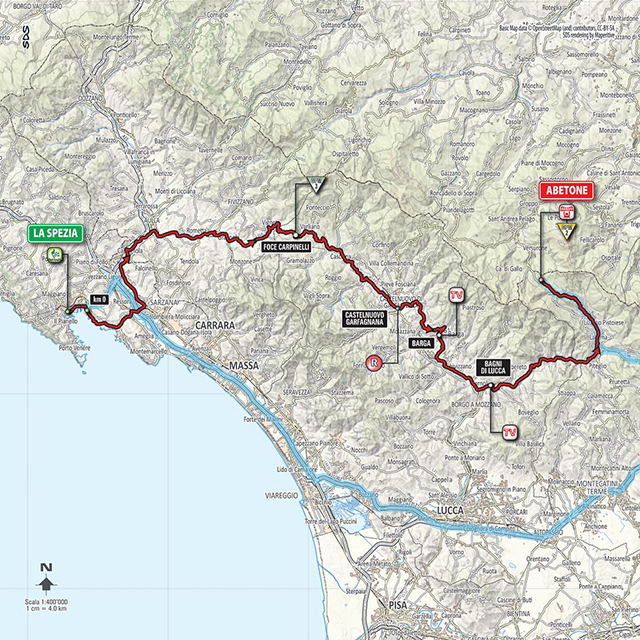 5 Richie Porte Sky s.t. 8 Yury Trofimov Katusha s.t. 9 Damiano Caruso BMC s.t. 10 Darwin Atapuma BMC s.t. 11 Damiano Cunego Nippo-Vini Fantini s.t. 13 Leopold Konig Sky s.t. 14 Silvan Dillier BMC s.t. 15 Ryder Hesjedal Cannondale-Garmin s.t. 16 Roman Kreuziger Tinkoff-Saxo s.t. 19 Ion Izagirre Movistar s.t. 21 Giovanni Visconti Movistar s.t. 22 Esteban Chaves Orica-GreenEdge s.t. 23 Michael Rogers Tinkoff-Saxo s.t. 26 Davide Formolo Cannondale-Garmin s.t. 27 Diego Rosa Astana s.t. 32 Maxime Monfort Lotto-Soudal s.t. 33 Alexandre Geniez FDJ.fr s.t. 34 Amaël Moinard BMC s.t. 35 Carlos Betancur Ag2r s.t. 37 Kanstantsin Siutsou Sky s.t. 38 Nathan Brown Cannondale-Garmin s.t. 39 Kenny Elissonde FDJ.fr s.t. 40 Andre Cardoso Cannondale-Garmin s.t. 41 Francesco Bongiorno Bardiani-CSF s.t. 43 Paolo Tiralongo Astana s.t. 44 Andrey Zeits Astana s.t. 49 Dayer Quintana Movistar s.t. 50 Tanel Kangert Astana s.t. 51 Franco Pellizotti Androni Giocattoli s.t. 52 Ivan Basso Tinkoff-Saxo s.t. 53 Gianfranco Zilioli Androni Giocattoli s.t. 54 Sebastian Henao Sky s.t. 59 Clement Chevrier IAM Cycling s.t. 60 Sander Armee Lotto-Soudal s.t. 62 Serghei Tvetcov Androni Giocattoli s.t. 65 Thomas Danielson Cannondale-Garmin s.t. 66 Ilnur Zakarin Katusha s.t. 67 Francis Mourey FDJ.fr s.t. 68 Luis Leon Sanchez Astana s.t. 69 Kristof Vandewalle Trek s.t. 71 Tsgabu Grmay Lampre-Merida s.t. 73 Branislau Samoilau CCC Sprandi Polkowice s.t. 76 Anthony Roux FDJ.fr s.t. 77 Matteo Montaguti Ag2r s.t. 79 Louis Vervaeke Lotto-Soudal s.t. 82 Alessandro Bisolti Nippo-Vini Fantini s.t. 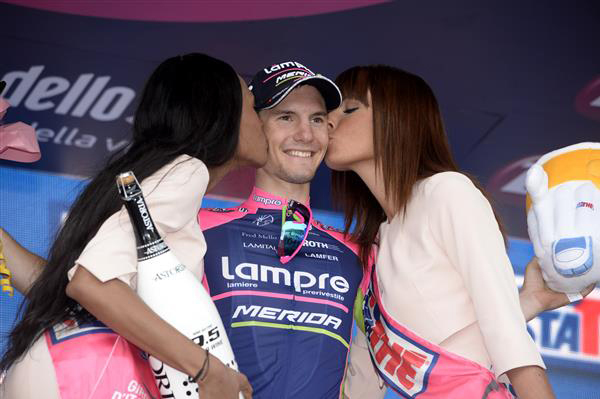 84 Manuele Mori Lampre-Merida s.t. 85 Stefan Küng BMC s.t. 86 Patrick Gretsch Ag2r s.t. 87 Giacomo Berlato Nippo-Vini Fantini s.t. 88 Luca Chirico Bardiani-CSF s.t. 89 Simon Gerrans Orica-GreenEdge s.t. 90 Heinrich Haussler IAM Cycling s.t. 91 Enrico Battaglin Bardiani-CSF s.t. 92 Matteo Tosatto Tinkoff-Saxo s.t. 93 Ivan Rovny Tinkoff-Saxo s.t. 94 Caleb Fairly Giant-Alpecin s.t. 95 Brent Bookwalter BMC s.t. 96 Sergio Paulinho Tinkoff-Saxo s.t. 97 Tom Jelte Slagter Cannondale-Garmin s.t. 98 Ruben Fernandez Movistar s.t. 100 Manuele Boaro Tinkoff-Saxo s.t. 103 Petr Vakoc Etixx-Quick-Step s.t. 104 Cédric Pineau FDJ.fr s.t. 106 Maarten Tjallingii LottoNL-Jumbo s.t. 107 Julien Berard Ag2r s.t. 109 Alessandro Petacchi Southeast s.t. 110 Enrico Barbin Bardiani-CSF s.t. 111 Marek Rutkiewicz CCC Sprandi Polkowice s.t. 112 Mauro Finetto Southeast s.t. 113 Lukasz Owsian CCC Sprandi Polkowice s.t. 114 Marco Frapporti Androni Giocattoli s.t. 115 Pier Paolo De Negri Nippo-Vini Fantini s.t. 116 Gang Xu Lampre-Merida s.t. 117 Maciej Paterski CCC Sprandi Polkowice s.t. 118 Matteo Busato Southeast s.t. 119 Pavel Kochetkov Katusha s.t. 121 Bertjan Lindeman LottoNL-Jumbo s.t. 122 Jussi Veikkanen FDJ.fr s.t. 123 Hugo Houle Ag2r s.t. 124 Maxim Belkov Katusha s.t. 125 Christopher Juul Jensen Tinkoff-Saxo s.t. 126 Cheng Ji Giant-Alpecin s.t. 127 Sonny Colbrelli Bardiani-CSF s.t. 130 Manuel Belletti Southeast s.t. 131 Bert De Backer Giant-Alpecin s.t. 132 Tom Boonen Etixx-Quick-Step s.t. 133 Eugert Zhupa Southeast s.t. 134 Moreno Hofland LottoNL-Jumbo s.t. 135 Rick Flens LottoNL-Jumbo s.t. 136 Eduard Michael Grosu Nippo-Vini Fantini s.t. 138 Fabio Silvestre Trek s.t. 139 Eugenio Alafaci Trek s.t. 140 Juan Jose Lobato Movistar s.t. 141 Alessandro Malaguti Nippo-Vini Fantini s.t. 142 Grega Bole CCC Sprandi Polkowice s.t. 143 Luka Mezgec Giant-Alpecin s.t. 144 Rick Zabel BMC s.t. 145 Michael Hepburn Orica-GreenEdge s.t. 146 Iljo Keisse Etixx-Quick-Step s.t. 147 Brett Lancaster Orica-GreenEdge s.t. 148 Nikias Arndt Giant-Alpecin s.t. 149 Nicola Ruffoni Bardiani-CSF s.t. 150 Sam Bewley Orica-GreenEdge s.t. 151 Roger Kluge IAM Cycling s.t. 152 Luke Durbridge Orica-GreenEdge s.t. 153 Elia Viviani Sky s.t. 154 Tom Stamsnijder Giant-Alpecin s.t. 155 Boy Van Poppel Trek s.t. 156 Greg Henderson Lotto-Soudal s.t. 157 André Greipel Lotto-Soudal s.t. 158 Pieter Weening Orica-GreenEdge s.t. 159 Lars Ytting Bak Lotto-Soudal s.t. 160 Murilo Antonio Fischer FDJ.fr s.t. 161 Daniele Colli Nippo-Vini Fantini s.t. 162 Stig Broeckx Lotto-Soudal s.t. 163 Bartlomiej Matysiak CCC Sprandi Polkowice s.t. 164 Salvatore Puccio Sky s.t. 165 Jaroslaw Marycz CCC Sprandi Polkowice s.t. 166 Nikolay Mihaylov CCC Sprandi Polkowice s.t. 167 Sacha Modolo Lampre-Merida s.t. 168 Simone Stortoni Androni Giocattoli s.t. 169 Riccardo Stacchiotti Nippo-Vini Fantini s.t. 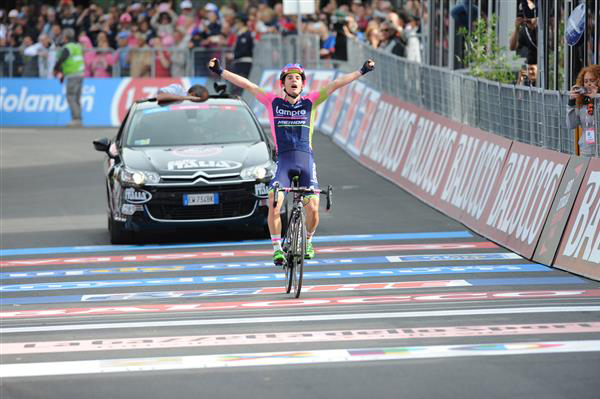 170 Matteo Pelucchi IAM Cycling s.t. 171 Aleksejs Saramotins IAM Cycling s.t. 172 Manabu Ishibashi Nippo-Vini Fantini s.t. 173 Vasil Kiryienka Sky s.t. 174 Kévin Reza FDJ.fr s.t. 175 Arnaud Courteille FDJ.fr s.t. 176 Davide Appollonio Androni Giocattoli s.t. 177 Elia Favilli Southeast s.t. 178 Bernhard Eisel Sky s.t. 179 Sergei Chernetski Katusha s.t. 180 Nicola Boem Bardiani-CSF s.t. 181 Alexander Porsev Katusha s.t. 182 Marcus Burghardt BMC s.t. 183 Roberto Ferrari Lampre-Merida s.t. 184 Marco Coledan Trek s.t. 185 Giacomo Nizzolo Trek s.t. 186 Marco Bandiera Androni Giocattoli s.t. 187 Oscar Gatto Androni Giocattoli s.t. 188 Michael Matthews Orica-GreenEdge s.t. 12 Rigoberto Uran Etixx-Quick-Step s.t. 14 Yury Trofimov Katusha s.t. 175 Riccardo Stacchiotti Nippo-Vini Fantini s.t. The early break. Axel Dumont leads Sylvain Chavanel. Simon Clarke enjoys his last moments in pink. 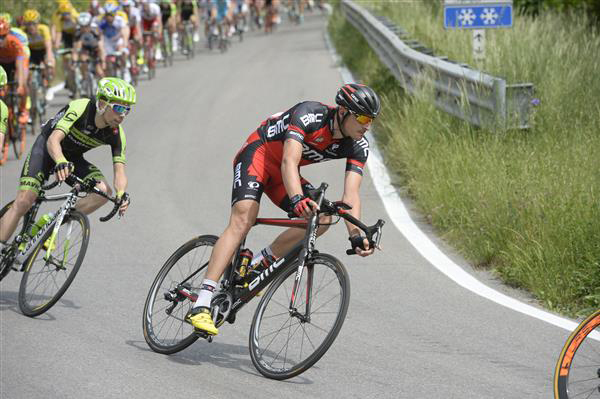 Richie Porte enjoying the ascent to Abetone. That should be Fabio Aru in light blue, chasing. Sylvain Chavanel climbs to Abetone. Rigoberto Uran lost more time today. Here is is on the Abetone ascent. 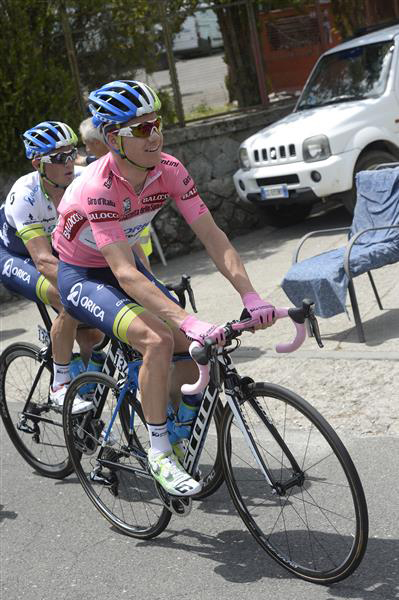 Diego Rosa leads Ivan Basso on the Abetone climb. 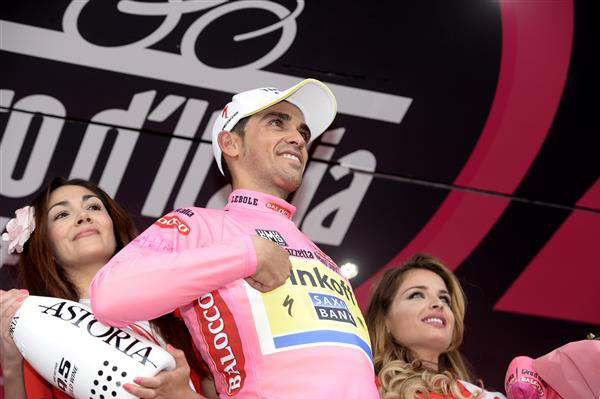 Alberto Contador in pink, making his sponsors happy.